Article from Teaching the Historical Jesus (Routledge, 2015). Mroczek, "The Hegemony of the Biblical in the Study of Second Temple Literature"
ARTICLE: The Hegemony of the Biblical in the Study of Second Temple Literature Eva Mroczek (Journal of Ancient Judaism 6.1 (2015), pp. 2-35.). Despite growing recognition that early Jewish culture was far broader than the Bible, the biblical retains its hegemony in the study of early Jewish literature. Often, non-biblical materials are read either as proto-biblical, para-biblical, or biblical interpretation, assimilated into an evolutionary narrative with Bible as the telos. But ancient Jewish literature and culture are far more than proto-biblical. Through a case study of psalmic texts and Davidic traditions, this article illustrates how removing biblical lenses reveals a more vibrant picture of the resources and interests of early Jews. First, it discusses evidence showing that despite a common perception about its popularity, the “Book of Psalms” was not a concrete entity or well-defined concept in Second Temple times. Instead, we find different genres of psalm collection with widely varied purposes and contents, and a cultural consciousness of psalms as an amorphous tradition. Second, it demonstrates how David was remembered as an instructor and founder of temple and liturgy, rather than a biblical author, a notion that, despite common assumptions, is not actually attested in Hellenistic and early Roman sources. Third, it reconsiders two Hellenistic texts, 4QMMT and 2 Maccabees, key sources in the study of the canonical process that both mention writings linked with David. While their value to the study of the canon has been challenged, the assumption that they use “David” to mean “the Psalms” has remained largely unquestioned. But when we read without assuming a biblical reference, we see a new David, and the possibility that the ancient writers were alluding to other discourses associated with him - namely, his exemplary, liturgical, and calendrical legacy - that better fit their purposes. Early Jews were not marching toward the biblical finish line, but lived in a culture with diverse other traditions and concerns that cannot always be assimilated into the story of scripture. Recognizing this fact allow us to see Second Temple literature more clearly on its own terms. This link is behind a subscription wall, but Dr. Mroczek has also posted it here at Academia.edu. Access to the latter is free with free registration. In these chapters, a group of renowned international scholars seek to describe Paul and his work from "within Judaism," rather than on the assumption, still current after thirty years of the "New Perspective," that in practice Paul left behind aspects of Jewish living after his discovery of Jesus as Christ (Messiah). After an introduction that surveys recent study of Paul and highlights the centrality of questions about Paul's Judaism, chapters explore the implications of reading Paul's instructions as aimed at Christ-following non-Jews, teaching them how to live in ways consistent with Judaism while remaining non-Jews. The contributors take different methodological points of departure: historical, ideological-critical, gender-critical, and empire-critical, and examine issues of terminology and of interfaith relations. Surprising common ground among the contributors presents a coherent alternative to the "New Perspective." The volume concludes with a critical evaluation of the Paul within Judaism perspective by Terence L. Donaldson, a well-known voice representative of the best insights of the New Perspective. AWOL: Open Access Journal: Oriental Institute Annual Report. The most recent one is the report for 2014-15. LARRY HURTADO: Lautenschlaeger Awards Notice for 2017. If you are a scholar aged 35 or under and you finished a doctoral dissertation or have published a first book after the dissertation (on a topic with some connection to "God and Spirituality"), you should read this. (MODERN) NEW TESTAMENT APOCRYPHA WATCH: “Jesus Was Black” Reveals Newly Found Manuscript. This ridiculous story has been kicking around for a while (WorldNet Daily picked it up during the summer). I had hoped it would fizzle out, but it is still getting attention, so I suppose I should comment on it. I'm pretty sure I have also seen it refuted on Facebook somewhere, but another time won't hurt. Archeologists from the University of Tel Aviv have found several ancient scrolls in the West Bank, close to the Qumran Caves. The caves are located 2 kilometers inland from the northwest shore of the Dead Sea. Interestingly, this is the same region where the Dead Sea Scrolls were discovered in 1947. The newly discovered scrolls have revealed tantalizing information on the physical appearance and life of Jesus Christ. It’s believed that these documents were written by the Essenes, a small Jewish sectarian group. Many elements of the Old and New Testaments have been retraced here, similar to the Dead Sea Scrolls. However, what have interested the scholars particularly are some fragments where the birth of Jesus has been described. There has been no recent report of new manuscript discoveries anywhere in the vicinity of the Qumran caves, and I certainly would have heard if there had been. None of the Dead Sea Scrolls mention early Christianity or Jesus. It has been argued that a few very fragmentary Greek manuscripts found at Qumran contained New Testament texts, but the manuscripts are so very fragmentary that one could find just about what one wanted in them with judicious reconstruction and these arguments have never found any significant support among scholars. Professor Hans Schummer reveals that the manuscripts describe Jesus as having a darker color of skin than her parents. One part of the scripture reads, “The infant was the color of the night”. Another section reads, “In the dark of the night, nothing could be seen of the infant except the white of his eyes”. The professor says that this is certainly “revealing” information. If the information is true, then Jesus could be of African descent. I can find no mention of a scholar named Hans Schummer at Tel Aviv University or anywhere else. The name comes up in Google only in connection with this story. The accompanying photo of a scholarly-looking man looking in a scholarly manner at a glass-enclosed manuscript is taken from a New York Times article from October 2014: Where Mud Is Archaeological Gold, Russian History Grew on Trees. The original caption to the photo reads "Pyotr G. Gaidukov, the deputy director of the Russian Academy of Sciences Institute of Archaeology, with newly found birch scripts." There is also reference to a servant of African origin named Melcha. Hebrew scholar Moshe Zuckenschtein says Joseph had 4 sisters and 5 brothers. It is also said that a child was born of the union of Jacob and his servant after his second wife had died. The name "Melcha" is apparently found in the New Testament apocryphal tradition as one version of the name of Joseph's first wife. I have checked around a little but so far have not found any further specifics. There is no "Hebrew scholar" named "Moshe Zuckenschtein." The name "Zuckenschtein" does not even look like a real name, it looks like a misremembering of "Zuckerstein." As for the thesis of the article, although Jesus wasn't the lily-white, blue-eyed blond of many devotional pictures, he wasn't of African descent either. He was a Galilean Jew and his skin color would presumably have been darker than European Caucasians but lighter than black Africans. The most interesting thing about this bogus story is that it shows that New Testament apocrypha are still being produced and avidly consumed even in the twenty-first century. ANCIENT JEW REVIEW: Daf Yomi: Sotah. Some bibliography for tractate b. Sotah, which began this week in the Daf Yomi reading cycle. Painstakingly, [Solomon] Schechter set about extracting and saving what he could [from the Cairo Geniza]. In the end, he shipped back to Britain 193,000 fragments of documents written in Hebrew, Judaeo-Arabic, Aramaic and Arabic. What became known as the Taylor-Schechter Genizah Collection found a home at Cambridge University Library where work began on it in earnest in the 1970s. The collection contains sacred scriptures and a vast array of personal letters, legal documents and other everyday material that sheds light on an underappreciated era of Egyptian and Islamic history. A handful of these documents forms the grand finale of a new exhibition at the British Museum in London. Egypt: Faith After the Pharaohs is the first major international show to tell the story of the 1,200 years of Egyptian history from the death of Cleopatra and Mark Antony in 30BC through the transition first to majority Christian and then to Muslim identity, culminating in the end of the Fatimid dynasty in 1171AD. This period of the country’s history has been neglected, by academics and the public imagination alike, says exhibition curator Elisabeth O’Connell, assistant keeper in the British Museum’s Department of Ancient Egypt and Sudan. “Egypt’s pharaonic past has certainly captured the imagination, and rightly so, of generations of people,” she says. In short, what came next was overshadowed by the sheer physical presence left on the landscape by the pharaohs. “The focus has very much been on that stone monumental building phase of Egypt’s history, and later subsequent mud brick remains and things that are not monumental are much more easily disregarded and, in fact, on the ground swept away. Background on the exhibition is here and links. And PaleoJudaica has a great many past posts on the Cairo Geniza. Start here and follow the links. FOR YOU, SPECIAL DEAL: Eisenbrauns Sale on Textual Criticism (Tommy Wasserman, ETC). WHAT'S IN A NAME? Why Are Palestinians Called Palestinians? The Palestinians don't see themselves as descendants of the Biblical invaders, but they are named for the Philistines just the same (Elon Gilad, Haaretz). The word "Palestinian" derives from the Philistines, a people who were not indigenous to Canaan but who had gained control of the coastal plains of what are now Israel and Gaza for a time. According to ancient Egyptian records of the period, which is the first written mention of them, the Philistines reached the region in around the 12 century BCE, which the archaeological record seems to confirm. Although it is likely that some Philistine blood runs through the veins of modern-day Palestinians (and through the Jews'), they are a different people with a different culture. Where the Philistines originated is a matter of debate, as they left no written records, but there are two main theories, based mainly on signature pottery shards. The original theory was that the Philistines originated in the Aegean basin and belonged to the Mycenaean culture. A newer hypothesis is that they were members of the Hurrian culture and came from what is today southern Turkey and Syria. In any case, given the current state of knowledge, it is impossible to determine the etymology of the Philistines’ name in their own language. What we can discuss is how this word morphed into the name of an altogether different people thousands of years later. And so he does, taking the development of the name up to the present. Good discussion. The origin of the name is a less complicated question than that of the genetic origin of the people who now call themselves "Palestinians." Genetic testing is probably advanced enough these days to make some progress toward answering the latter question. Meanwhile, some years ago I posted some thoughts on the subject here (point 2). SPECTACULAR INDEED: Ancient Judean Seal Found in 2,000-year-old Russian Warrior Woman’s Grave. At first the amazed Russian archaeologists thought the seal was Philistine or Aramaic. It's ancient Hebrew, and says 'Elyashib,' like seals found at fortress Arad. (Julia Fridman, Haaretz). Well done, Ms. Fridman, for publicizing this important discovery. However, let it be noted — since this article doesn't — that back in August (here, here, here, and here) I broke this story based on the Daily Mail article that publicized the seal. I deciphered the seal, gave a correct date range for it, and recognized that it was probably in Hebrew. Aviv Benedix also followed the story up at his Times of Israel Blog (see here and here) and many of the points raised in the Haaretz article were already raised in the discussion in his posts and in my blog comments on them. What the writing says is simply the name "Elyashib," son of Oshiyahu, whom we know as the commander of an isolated Judean fortress, Arad. ... the natural implication of this sentence, although this may just be due to unclear phrasing, is that the Elyashib (= Elyashiv) of the Russian seal is the same Elyashib as the commander of the fortress at Arad. As I have already said, there is no reason to think they are the same person. As the article goes on to note, the name is found in a number of unrelated inscriptions. It does not note, although I did, that the name also appears in the Bible. Also, I would vocalize the name of the Arad Elyashiv's father as something more like 'Ishyahu (אשיהו), "Man of YHWH." Second, contra the headline (but correctly in the article), the archaeologists thought it might be Phoenician, not Philistine. Also, a reminder: you can view a limited number of Haaretz premium articles monthly without charge if you sign up with a free registration. UPDATE: I have been in touch with Julia Fridman and have learned that she credited both me and Aviv Benedix in her original article, but the credits were removed through an editorial error. She has instructed the editor to add the credits again. Unfortunately, I have now used up my free premium-article allowance for Haaretz and can't view the article again, but I assume the credits have been or imminently will be restored. Thanks to her and Haaretz for correcting the error. YONA SABAR: Hebrew word of the week: Sakkanah Danger. A 1,000-year-old Bible has been uncovered by police in Turkey after smugglers tried to sell the priceless book to undercover officers. Police in the central Turkish city of Tokat confiscated the ancient Bible together with other priceless artefacts after catching the smugglers red-handed. Three men have who were attempting to sell the Bible, written in the old Assyriac language, to undercover police officers have been arrested. We have been down this route before. First there was the bogus Gospel of Barnabas manuscript that turned out to be, at best, an early modern manuscript of the Gospel of Matthew, and this possibly even a forgery. That story still keeps surfacing. Then there was the "priceless 300-year-old religious manuscript in Syriac" recovered from smugglers in 2013, on which see here and here. Plus earlier that year the Turkish authorities recovered a Hebrew Torah scroll from smugglers and then promptly announced that it was 1,900 years old. No. (See here and here). All that, of course, does not make this story erroneous, but I see some warning flags. The Mail reporter obviously did not run the story by any specialists or they would have told her that there is no "Assyriac" language. This is a non-word, an amalgamation of "Syriac" and "Assyrian," both of which actually are Aramaic dialects. No reason is given for regarding the manuscript to be 1,000 years old. And I have noted before that a number of fake manuscripts with gold lettering have turned up in recent years. That so-called Gospel of Barnabas manuscript also has gold lettering. That's not exactly the same as gold decoration, but it is worrisome. I know of a few real Syriac manuscripts that have gold lettering, but none earlier than the thirteenth century. This particular manuscript is in poor condition, either because it is old, or because it is young but has been stored poorly (e.g., in a damp environment), or because a forger has treated it to make it look old. The script seems to be Syriac, but the photo is too poor to make much out. There are plenty of illuminated (i.e., with pictures) Syriac manuscripts from antiquity up to the present, so it's hard to say anything about the picture. I am skeptical about the supposed great age and value of the manuscript, but I'll reserve judgment until I hear definitively from Syriac paleographers and art historians. Meanwhile, even if the Turkish authorities sometimes get a little carried away about the value and importance of the manuscripts they recover, they deserve praise for keeping up the pressure on smugglers. UPDATE: Seen on Facebook: 1000 year old Bible found in Turkey's Tokat. A video that gives a reasonably good view of each page of the manuscript. UPDATE (5 November): More here and here. AWOL: Aramaic Texts from Egypt (also including Phoenician and Hebrew). As it often happens in research, some good came as a result of what happened. Public concern raised by the Palmolive Indiana Jones YouTube exploits has pulled together a multidisciplinary team of specialists lead by Melissa Terrace (UCL) and Mike Toth (R.B. Toth Associates), including myself among others, that has received funds from Arcadia Foundation to investigate how special imaging techniques, such as multispectral technology, can lead to the establishment of non invasive methods for reading papyri encapsulated in mummy masks and other cartonnage objects. We named the project Making the Mummies Talk. More on the Palmolive soap story is here (second link). Some related posts are collected here. Non-invasive and non-destructive technologies are the way of the future. For non-invasive scanning of manuscripts, see here and links. ARCHANGEL METATRON WATCH: Climate Change and Lizards: Reproduction Strategy May Need to Change, Researchers Say (Samantha Mathewson,Nature World News). For their study, researchers used a Metatron, which is a system of semi-natural enclosures that allowed them to manipulate temperatures. Well, Metatron has been interested in ecology for some time. Review of "Egypt: Faith After the Pharaohs"
MUSEUM EXHIBITION: Egypt: Faith After the Pharaohs review – a magical dig into the past. 5 / 5 stars British Museum, London With its miraculously preserved ancient objects – precious texts, gleeful art, children’s toys – Neil MacGregor’s last hurrah gets close to solving the mystery of religion itself (Jonathan Jones, The Guardian). A positive review of what sounds like an excellent exhibition. The review itself is generally informative but has a couple of errors. Trying to understand North Africa or the Middle East without somehow going to the heart of faith is like trying to read a book in a language you don’t understand. This exhibition begins with books that are indeed written in languages I don’t understand: Hebrew, Greek and Arabic. They are some of the most precious religious manuscripts on Earth, laid side by side here,just as the communities they speak to have lived side by side in Egypt for millennia. A ninth/10th-century Jewish Bible, with bright abstract illuminations among the handwritten Hebrew letters, sits near the Codex Sinaiticus – the oldest complete Christian New Testament in the world, made at the Monastery of St Catherine in Sinai in the mid-fourth century AD (that is, under the Roman empire). Nearby is a gorgeous page from an eighth-century copy of the Qur’an, created a century after Egypt was conquered by Islam. The Codex Sinaticus was not "made" at St Catherine's Monastery, although it was housed there for a long time. The manuscript was written at an unknown location in the fourth century, while the monastery was not founded until the sixth century (although there was a chapel there as early as the fourth century). Among these strange gods there was also one god – Jehovah. Jews had a long history in Egypt, according to the Bible, but as Simon Schama points out in his book The Story of the Jews their real, tangible history is first documented by those magically preserved Egyptian papyri – such as a letter exhibited here from the Roman emperor Claudius, in which he tells locals not to worship him as a god and instructs them to tolerate the Jews. The name "Jehovah" is an error promulgated by Renaissance Christian Hebraists who misunderstood that the consonantal Hebrew text of the the name of God, YHWH, was written with the vowels for the Hebrew word "My Lord" ('Adonay) in the Masoretic Text of the Hebrew Bible. This was to indicate to the reader that the name should be pronounced 'Adonay. Move the misunderstanding into Latin and you get "Jehovah." Ancient Egyptian Jews and those they influenced generally referred to this God as Yahu or Yaho (in Aramaic) or IAO (in Greek). More on the exhibition is here and links. The Elephantine papyri are the earliest Egyptian papyri dealing with Jews, on which more here, here, and links. TEMPLE MOUNT WATCH: Wall Street Journal Misidentifies Judaism's Holiest Site (CAMERA). The Western Wall is a holy site to Judaism, but Judaism's holiest site is the Temple Mount. I watched the video, which is here. It is on the WSJ website, but it credits itself to the AP. The video now clearly says "Judaism's holy site," which is an odd expression. I would expect something like "one of Judaisms holiest sites" or "a holy site for Judaism" or the like. Has the video been redubbed to say "holy" rather than the original "holiest?" EXCAVATION: Archaeologists breathing life into 2,000-year-old Citadel of Machaerus (Dana Al Emam, The Jordan Times). Machaerus is not actually mentioned in the New Testament, but we learn from Josephus that John the Baptist was executed there and that Herodias's daughter (unnamed in the NT) was named Salome, and so we place the story about her and John the Baptist there (Mark 6:14-29 par.). More on that here. More on the current excavation at this Bible History Daily post: Machaerus: Beyond the Beheading of John the Baptist. TRACTATE SOTAH STARTS TODAY IN DAF YOMI: The Sotah Spectacle: The Mishnah’s rewrite of the Biblical ritual (Prof. Ishay Rosen-Zvi, TheGemara.com). THE GREEN COLLECTION: Exclusive: Feds Investigate Hobby Lobby Boss for Illicit Artifacts. One of America’s most famously Christian businesses is amassing a vast collection of Biblical antiquities. The problem is some of them may have been looted from the Middle East (Candida Moss and Joel Baden). These tablets, like the other 40,000 or so ancient artifacts owned by the Green family, were destined for the Museum of the Bible, the giant new museum funded by the Greens, slated to open in Washington, D.C., in 2017. Both the seizure of the cuneiform tablets and the subsequent federal investigation were confirmed to us by Cary Summers, the president of the Museum of the Bible. If the investigation ends with a decision to prosecute, on either criminal or civil charges, the Greens may be forced to forfeit the tablets to the government. There may also be a fine involved. The Green family, who successfully forced the federal government to legally recognize their personal moral standards, now find themselves on the other side of the docket, under suspicion of having attempted to contravene U.S. laws. This is potentially quite significant and could be very damaging to the reputation of the Green Collection. But we should also keep in mind that no charges have been filed at this point and that the key specifics that follow in the article come from an anonymous "source familiar with the Hobby Lobby investigation" and we should hold out for some verification. That said, Moss and Baden are good at keeping their facts in order and would not have published the article if they didn't think they had good reason. Watch this space. The Talmud on who can be a nazirite, shaving body hair, etc. Throughout Tractate Nazir—whose end Daf Yomi readers approached this week—there has been a very natural assumption that the only people who can become nazirites are Jews. Indeed, it never occurred to me that it could be otherwise: Isn’t naziriteship a part of Jewish law, as laid down in the Torah? Yet in Nazir 61a, the rabbis point out that the textual basis for naziriteship, in the Book of Numbers, is not crystal clear on this point. The subject is introduced with the words, “Speak to the children of Israel and say to them: When a man or woman shall clearly utter a vow, the vow of a nazirite, to consecrate himself to the Lord.” The phrase “speak to the children of Israel” seems to imply that what is to follow—the rules and restrictions of naziriteship—is intended for Jews only. DISCOVERY: Ancient winery discovered in central Israel region during storm. Large 1,500-year-old winepress unearthed in area once known for wine production (DANIEL K. EISENBUD, Jerusalem Post). When water was pumped from the site, [IAA archeologist Alla] Nagorski said the well-preserved winery was found. She described it as impressive and rare. PALMYRA WATCH: IS said to blow up Palmyra columns to execute 3. Monitor claims jihadist group tied prisoners to ancient pillars before exploding them at historic Syria site (AFP). Background on the ancient Aramaic-speaking city of Palmyra and on the assault of ISIS on the past and its caretakers is here and links. TODAY AT THE UNIVERSITY OF TENNESSEE: Archaeology Lecture Series Explores Roman Fort in Israel October 27. Gwyn Davies, an expert on Roman siege warfare, will discuss the Roman fort of Yotvata during a lecture on Tuesday, October 27. Davies, an associate professor of history at Florida International University, will speak at 7:30 p.m. in the auditorium of the McClung Museum of Natural History and Culture, 1327 Circle Park Drive. His lecture, which is free and open to the public, is titled “The Late Roman Fort at Yotvata, Israel.” It is the third lecture in the series organized by the East Tennessee Society of the Archaeological Institute of America and the McClung Museum. TEMPLE MOUNT WATCH: Jerusalem mufti: Temple Mount never housed Jewish Temple. Sheikh Muhammad Ahmad Hussein says Al-Aqsa Mosque has been atop disputed holy site ‘since creation of the world’ (Ilan Ben Zion, Times of Israel). This latest, egregious example of Palestinian Jewish-Temple denial borders on Islamic-fundamentalist creationism. This is not the first time the current Grand Mufti of Jerusalem has indulged in Temple denial (see here). And his predecessor, Dr. Ekrima Sabri, has done likewise (see here). But it's certainly been a while, if ever, since I have seen it on this jaw-dropping scale. The closest I can find to it is here, where it was claimed that the Al-Aqsa Mosque was built more than a thousand years before Solomon. Recent background on the ancient Jewish temples on the Temple Mount and denial of them in Palestinian propaganda, sometimes enabled by the Western media, is here and links. Steven Weitzman (Harvard Theological Review 108.3, July 2015, pp. 423-447). Like so much of early Jewish literature, the strange Dead Sea scroll known as the Copper Scroll (3Q15) remains suspended somewhere between reality and fantasy. Even before scholars had fully unrolled its copper plates in 1956, they were able to discern that it recorded a list of treasures, but there soon broke out a dispute over whether this treasure was real or not. Some scholars felt that the treasure was too large to be real and that it was a figment of its author's imagination. 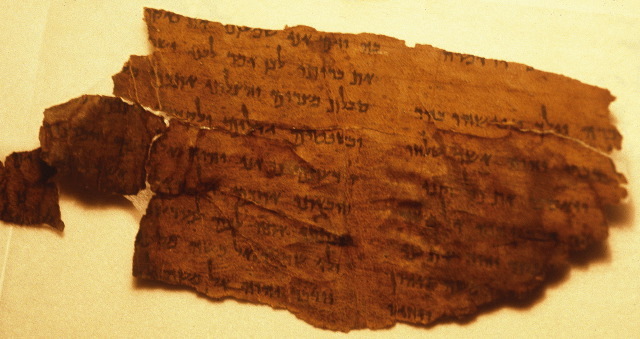 They sought the origins of the scroll in ancient Jewish legend. Others believed the treasure to be quite plausible, probably connected to the Temple in some way. The scroll itself, however, revealed nothing that might settle the issue in one direction or the other. In what follows, I wish to explore a way beyond this impasse, not resolving whether the treasure was real or not, but suggesting how it could be both at the same time. Such a claim will seem contradictory, but it is my hope over the course of this essay not just to establish the possibility of such a position but to demonstrate that such a reading is actually more consistent with the evidence we have than any reading that imposes an either/or choice between reading the treasure as fictional or genuine. The article also deals with the legendary account of the Temple treasures called The Treatise of the Vessels (Maasekhet Kelim), on which I have published many posts and two articles. For past posts on both the Copper Scroll and The Treatise of the Vessels, start here and here and follow the many links. The article seems to have gone to press before the publication of my translation of The Treatise of the Vessels: "The Treatise of the Vessels (Maasekhet Kelim)" in Old Testament Pseudepigrapha: More Noncanonical Scriptures, vol. 1 (ed. Bauckham, Davila, and Panayotov; Eerdmans, 2013), pp. 393-409. In that article I also discussed the Lindian Temple Chronicle, although in relation to the Treatise of the Vessels, not the Copper Scroll. Weitzman's comparison of the Chronicle to the Copper Scroll is an intriguing advance of the discussion. A flake of limestone (ostracon) inscribed with an ancient Egyptian word list of the fifteenth century BC turns out to be the world's oldest known abecedary. The words have been arranged according to their initial sounds, and the order followed here is one that is still known today. This discovery by Ben Haring (Leiden University) with funding from Free Competition Humanities has been published in the October issue of the Journal of Near Eastern Studies. The order is not the ABC of modern western alphabets, but Halaḥam (HLḤM), the order known from the Ancient Egyptian, Ancient Arabian and Classical Ethiopian scripts. ABC and HLḤM were both used in Syria in the thirteenth century BC: cuneiform tablets found at site of ancient Ugarit show both sequences. Back then, ABC was still '-b-g ('aleph-beth-gimel). This sequence was favored by the Phoenicians who passed it on to the Greeks, together with the alphabet itself. Thus a-b-g found its way to the later alphabets inspired by the Greek and Latin ones. You can read the JNES article by Ben Haring at JSTOR: Halaḥam on an Ostracon of the Early New Kingdom? But notice that the article ends with a question mark, which is why my title above does likewise. Not mentioned in the PhyOrg article is that parts of the rest of the sequence of sounds are preserved on the ostracon and they correspond only in a vague way to the traditional Halaḥam alphabetic sequence. So the case is not airtight, although it does seem quite likely that this is an early and fluid example of what eventually would become a fixed sequence of sounds and letters. Wish I could go. If you happen to be in the vicinity and want to attend, you need to register for the event in advance. Follow the link for information. A Maccabean-era synagoge at Delos? (first posted 19 October). I'm not quite caught up on updates, but I am getting there as time permits. Thanks to readers who have sent in new information and corrections. Please be patient as I get to them, and please keep them coming! FOUR BOOKS ON THE APOSTLE PAUL REVIEWED: Who Was Saint Paul? (G.W. Bowersock, The New York Review of Books). ANGLO-SAXON SCRIBES READ HEBREW, WROTE HEBREW (SOMETIMES BADLY), AND EVEN FAKED HEBREW: Fort Wayne English instructor turns medieval spy (Jamie Duffy, AP). How interesting. You find something similar to the faked Hebrew in a good many Babylonian incantation bowls from around the seventh century C.E. Apparently some of the magicians who produced the bowls knew the Aramaic incantations verbally, but were themselves illiterate. Since their clients were also illiterate, this didn't really matter. They just produced bowls inscribed with realistic-looking squiggles that weren't even actual letters. Presumably they then performed the correct ritual and recited the correct incantation, buried the bowl under the client's threshold to drive away demons, and took payment. Everyone was happy. I'm not suggesting that the Anglo-Saxon scribes wrote fake Hebrew for the same reasons. Read the article for more on what they many have been about. ANCIENT JEW REVIEW: Dissertation Spotlight: Sara Ronis. Ronis, Sara. “Do Not Go Out Alone at Night”: Law and Demonic Discourse in the Babylonian Talmud. Ph.D. Dissertation. Yale University, 2015. MATTERS PALEOJUDAIC IN SPANISH: First, on Christian origins, Orígenes Del Cristianismo. The Group research on the origins of Christianity (GISOC) is formed by students and scholars from various Spanish universities that for years have been working together and developing joint projects. Our goal as a group is to study from an interdisciplinary perspective the formative period of Christianity (approx. 30-180 AD), taking into account the various factors involved in this process, both historical and contextual, as the literary and theological. The group's activities include seminars, symposia and joint publications and the organization of a university graduate. This English summary comes from reader "Manuel HG," who runs the new website Masora digital. estudios bíblicos en español. And it is worth mentioning again the interesting blog by Tomas Garcia-Huidobro: Experiencias Religiosas y Escrituras: temprano misticismo judío, cristiano, y gnóstico como medios para iluminar los orígenes del cristianismo, which I have already noted here.